And that's for a message drawn up by a fellow human. It will doubtless be much tougher to decode something devised by creatures from a distant solar system who share no cultural or evolutionary history with us, who may rely upon different senses to perceive their environment and to communicate, and who are probably far more advanced technologically than we are. So, we'll likely need to marshal the collective wisdom of the world, in a massive citizen-science project, to identify (and agree upon) the "right" answer, Wells-Jensen said. And our chances of success in this endeavor would be greatly increased if we all hit the books a little, to increase our critical-thinking skills and our understanding of nature and how it works, she added. "One of the goals of METI — and I really think it should be a goal of all of us — is to work on this science-literacy problem," Wells-Jensen said. The linguist was originally scheduled to present her results on Saturday (May 26), during a workshop at the International Space Development Conference (ISDC) 2018 in Los Angeles. But she nixed that after running out of time. Wells-Jensen has been pretty busy; she chaired the workshop, which is called "Language in the Cosmos," and she co-authored another workshop study. The daylong workshop, which was organized by METI, explored the possibility that language — or at least certain essential elements of language — might be universal throughout the cosmos. Famed linguist Noam "Chomsky has often said that if a Martian visited Earth, it would think we all speak dialects of the same language, because all terrestrial languages share a common underlying structure," METI President Doug Vakoch, who also presented a paper at the workshop, said in a statement. 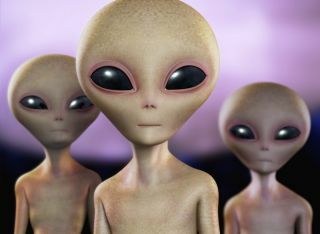 "But if aliens have language, would it be similar to ours? That's the big question." "I don't think we know, but this is a nice hypothesis to play with," she said of the language-universality idea.